One of my favorite iPhone apps is Rotary Dialer. There’s just something fun about making the latest and greatest device act like something from the 60s. Rotary Dialer isn’t like the “classic” phones from Pottery Barn, where the buttons are just laid out like a rotary phone. You have to make a circular motion from the number you want to the metal thing at the end. (Anyone know what that’s called?) And just like on real rotary phones, if you slip you have to start all over. It took me 1 minute and 2 seconds (and three tries) to dial my own number. 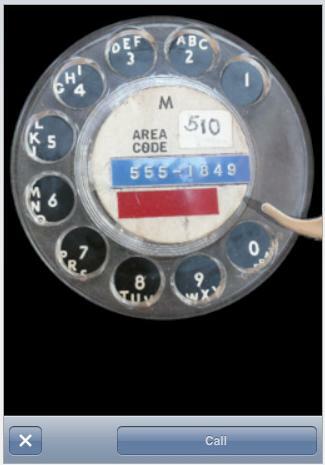 “Dial” is one of those words that still hangs in there, despite a lot of changes in technology. Most people haven’t “dialed” phones in this country in two decades. When I was in Minnesota, the local phone company made it impossible. It was costing them too much to maintain the equipment to detect the pulses, so they forced everyone to Touch Tone. Film, rolls. We film events, even though a lot of that is actually on DV tape or recorded on an SD card. Hollywood still makes actual films, but many of those are now going digital. Apple refers to the recent pictures on the iPhone as the “Camera Roll”. Rewind. Back in the day, the VCR had to physically rewind the tape to show a scene you missed. Now you hit rewind, but you’re probably just going back through a buffer. Albums. Vinyl has all but disappeared, but album art is still with us. Even the compilation aspect of the album is rapidly disappearing as people can pick and choose tracks they want to buy. Washboard stomach. I think I might have seen a washboard in a museum, but I can’t be sure. At least we still have six packs. Slides. I can’t remember the last time I was in a business presentation that used actual slides. Possibly never. But I’ve sat through endless presenters drone on to stills on a screen. Ship. When you send something by FedEx, it’s most likely going by plane or truck. At least we don’t call planes flying boats anymore. Turn off the the TV. With no more knobs to turn, we’re actually pushing it off. With Kinect, we may soon be waving it off or flipping it off. This entry was posted in apple, fun, iphone. Bookmark the permalink. I’d like to point out that washboards are alive, well, and certainly in use. Maybe not for their original purpose (washing), but just go down to Nawlins and pop into any bar on Bourbon Street and you’re guaranteed to see (and hear!) one. Sorry to tell you, but ‘album’ doesn’t refer to just vinyl. Album refers to the entire collection of music – regardless of release format. They were first called albums because the multi-disc containers looked like photo albums. As record length increased they kept the name ‘album’ since it referred to that musical collection. 8-tracks, cassettes, CD’s, and mp3’s from the iTunes store – all albums. I was at Best Buy a while back, and they had a new Journey’s Greatest Hits – in mp3 format on a Journey-themed mp3 player. It’s still an album. Even with iTunes sale of single tracks, there are artists (notably Pink Floyd) who are pushing back against the splitting of the album.